Thankfully, Nicole said “yes,” and the two of them continued their hike to the Tierser Alpl Refuge where they met up with 18 Ryder-Walker guests (2 groups total) and fellow trip leaders Ken Fuhrer, Babsi Glanznig and Chris Pranskatis. A big celebration ensued, and the champagne flowed all around. For those that don’t know Mike and Nicole, Mike has been with Ryder-Walker for 6 years and is an accomplished tour leader. Nicole joined us a few years ago, working on and off in various capacities, and now works full time as our go-to travel consultant. You can read about them at our bios page. Please give them big hugs the next time you see them. A HUGE congrats from all of us! Top photo: Mike and Nicole in front of the Tierser Alpl Refuge. 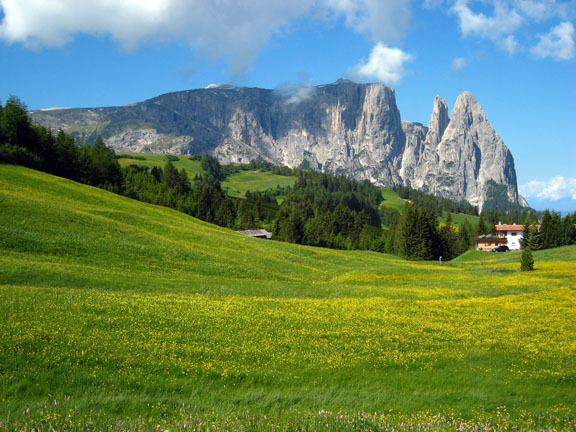 Bottom photo: Seiser Alm (Alpe di Siusi) with the Schlern (Sciliar) mountain in the background.